B & R Farms, California Lavender, Fudge Is My Life, Lundberg Farms, Napa Tapas, Russo’s, Sartain’s Menu, Surf City Coffee and The Occasional Gourmet. Just before show time, Mari Rossi of B & R Farms had her dried Blenheim apricots and apricot products ready for the trade to taste. The San Francisco Wine Competition has grown to become the largest and most prestigious wine competition for American wines in the world. Sponsors are: San Francisco Chronicle, sfgate.com, Cost Plus World Market, Schott Zwiesel stemware, KGO Newstalk AM 810, and NBC 11. 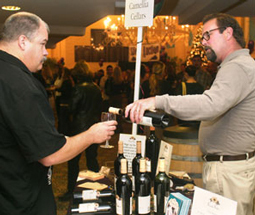 At the Award Tasting, approximately 400 medal winning wines were poured, and forty Savor California Marketing Partners sampled their specialty foods for a wine- and gourmet food-loving crowd of over 3,000. The two-month-long Napa Valley Mustard Festival culminated in the “The Marketplace” on the grounds of Copia -- the American Center for Wine, Food and the Arts, on the Napa River in Napa. Mustards and an array of fine gourmet products were showcased, including those made by Savor California producers: B & R Farms, Balzana Olive Oil, Carol Hall's, Lodestar Olive Oil, R. Genou California, Sartain's Menu, Sauce Goddess, Shelley's Biscotti and Terra Sonoma. 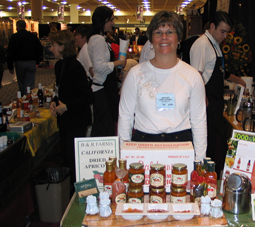 Mari Rossi of B & R Farms offers samples of her dried Blenheim apricots, chutneys and jams. The Orange County Wine Society’s spring wine tasting featured boutique wineries and some of Orange County’s finest restaurants. 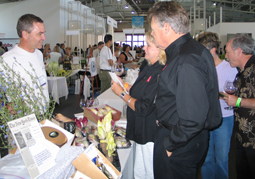 New this year were gourmet specialty foods from SavorCalifornia.com, offered by All Star Gourmet, Balzana Olive Oil, California Lavender, Meyenberg, Robert Lambert, Rosie's Kitchen, Santa Barbara Olive Company, Santa Barbara Pistachios, Stella Cadente Olive Oil, and The Chocolate Traveler. A delighted fan tastes one of Robert Lambert's chocolate sauces. B & R Farms, California Lavender, Curtz Foodz, Donsuemor, Eddison & Melrose, Majack's, Meyenberg, Peanut Better, Santa Barbara Pistachios, Shelley's Biscotti, Sonoma Toffee, TeaLeaf of Carmel, Valley Fig Growers and Wild Planet. Savor California producers who participated in the Beer and Wine Garden were Ace Cider and North Coast Brewing Company. Meyenberg Goat Milk Jack-style goat cheeses and goat milk butter were very popular. Gail demos Santa Barbara Pistachios, Zelda serves Donsuemor Madeleines, Susan offers samples of California Lavender jellies, and Evan gives out chunks of Sonoma Toffee. 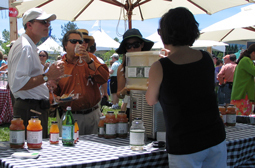 Savor California products -- LaLoo's Goat Milk Ice Cream, Nana Mae's Organics apple juice, Numi Tea and Robert Lambert's syrups and preserved fruits -- were showcased at the spectacular Barrel Tasting & Auction. Kendra Kolling pours samples of Nana Mae's 100% Gravenstein Apple Juice and Mid-Season Blend Apple Juice. This gathering once again celebrated food, wine and conviviality, with members of La Chaîne des Rôtisseurs and their guests coming from all over the United States. 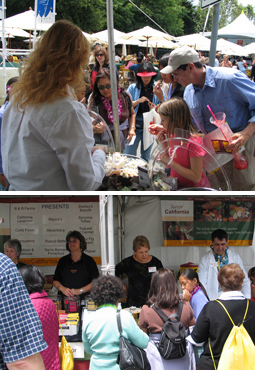 An extravagant array of gourmet products from Savor California producers was available to taste and purchase. The Bay Area Wine Project hosted Pinot Days to celebrate the many styles of Pinot Noir. 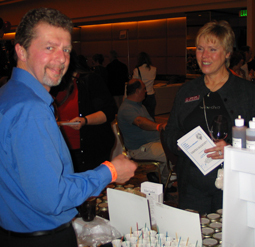 Forty gourmet specialty food producers on SavorCalifornia.com served samples and sold products. Rich Collins of California Vegetable Specialties shows how endive is grown and offers tastes of this pretty delicacy. 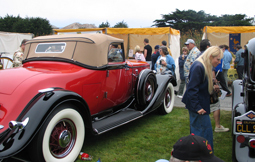 The Half Moon Bay Coastside Chamber of Commerce & Visitors’ Bureau presented this classic car show against the spectacular backdrop of The Ritz-Carlton and the sparkling water of Half Moon Bay. 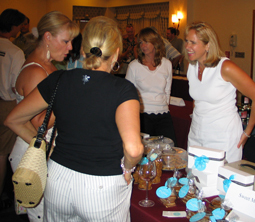 Allie's Edibles, Carol Hall's Jelly, LaLoo's Goat Milk Ice Cream, Lodestar Olive Oil, Shelley's Biscotti and Sonoma Syrup were sampled and sold to the car-loving and gourmet-food-loving crowd. This event for the food writers, restaurateurs, chefs and other food professionals, who are members of the San Francisco Professional Food Society, included the tasting and sale of specialty food products made by producers on SavorCalifornia.com. 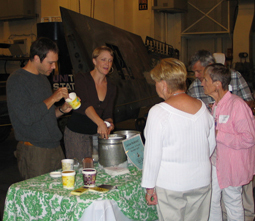 Tastes of LaLoo's Goat Milk Ice Cream are served against a backdrop of vintage aircraft on the hangar deck of the USS Hornet. 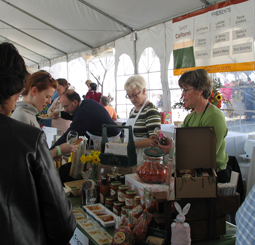 An all-day tasting, sampling and marketplace celebration with artisan food makers, farmers, food writers, and chefs. Located in the Russian River area of Sonoma County, this event draws from the best gourmet food producers of the region. 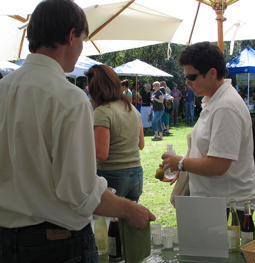 Kim Severson of the New York Times talked with Pat Galvin about his Vignette Wine Country Soda, at the 2006 Russian River Food and WineFest. The Sonoma County Press Club and Northern California Media present one of Sonoma County’s largest tastings. Nearly 2,,000 food-and-wine-loving patrons attended to support the Torkelson Journalism Scholarship Fund. Bruce Snyder poured Camellia Cellars wine.